The reason I ran through the plot quickly, even though most people are familiar with it already, is to illustrate how talented director Roman Polanski is (or was). I mean, when you strip it to the bare bones, that story is preposterous and over-the-top and seems destined to become a standard schlocky b-movie. But Polanski knew how to do it right. He keeps many of the more incredible events off-screen and forces us to experience them through Rosemary Woodhouse's limited perspective. When Rosemary is drugged and impregnated, for instance, we 'see' the events through her eyes, as a blend of hallucination, dream, and reality—a kaleidoscopic vantage which saves the film from getting bogged down in the literality of the supernatural event. Polanski treats Rosemary's Baby as a psychological horror film rather than as a traditional supernatural horror film. 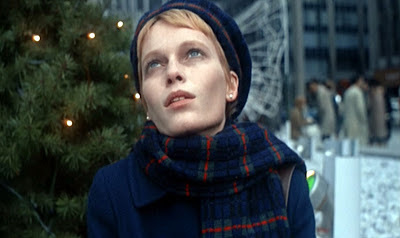 Mia Farrow plays Rosemary with a fragility and guilelessness that makes her predicament somehow believable. Perhaps real-life events helped her in her hollow-eyed, depleted performance: Professional jackass Frank Sinatra reportedly served her with divorce papers on the set of Rosemary's Baby (because she would not give up her acting career for him). At any rate, Farrow really set the standard for wide-eyed vulnerability in horror flicks that would follow. We believed in her experiences because we believed in her. But you can't really talk about Rosemary's Baby without talking about Ruth Gordon's performance, can you? She deservedly won an Oscar for her work here in the role of Minnie Castavet. She's gaudy, ridiculous, funny, eerie, and menacing all the same time. How is that even possible—right? 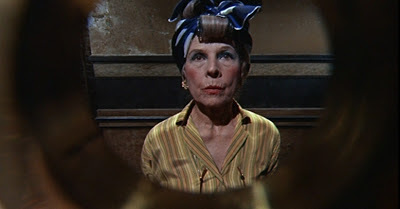 I kind of think the role of Minnie is the flip-side of the joyous, life-affirming Maude from Harold & Maude. Minnie's like a slithery, rasping wraith in blue eye shadow and garish house dresses, but it's probably her singleness-of-purpose and her nonchalance in consorting with devil that's the most disturbing. Other old women garden or knit; she facilitates the birth of Satan's son. The object is different, but the passion's the same. Now we're getting to the good stuff! Farrow looks like a cadavar in that picture, which I guess adds to the creepiness. I'm trying harder to please you, Velocitor! Haha, I used that picture of Minnie through the peephole for years as my avatar on a certain rock music forum. I'm an old lady barging in on the young whippersnappers fun and conversations . Just changed it a few days ago to a close up of my cat.